To move beyond the simplistic shapes offered by drawing circles and rectangles, our programs need the ability to work with bitmapped graphics. Bitmapped graphics can be photos or images created and saved from a drawing program. But graphics aren't enough. Games need sound too! This chapter shows how to put graphics and sound in your game. The programs we've made so far only involve one file. Now that we are including images and sounds, there are more files that are part of our program. It is easy to get these files mixed up with other programs we are making. The way to keep everything neat and separated out is to put each of these programs into its own folder. 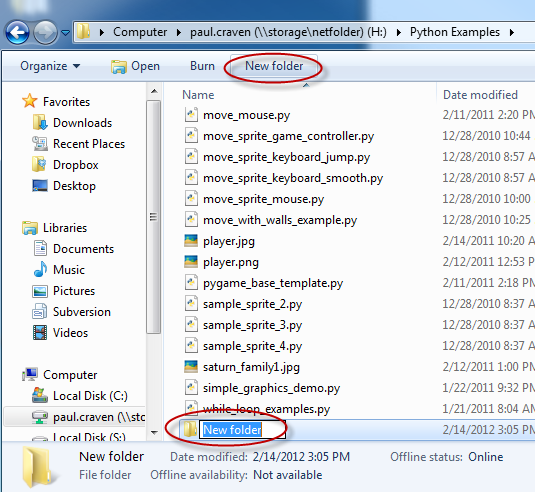 Before beginning any project like this, click the “new folder” button and use that new folder as a spot to put all the new files as shown in Figure 11.1. Need to set a background image for your game? 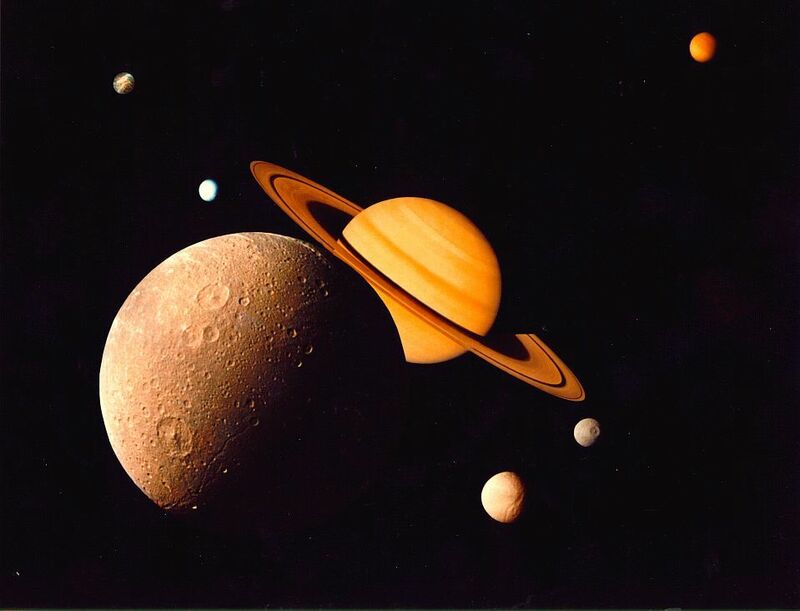 Find an image like Figure 11.2. If you are looking on-line in a web browser, you can usually right-click on an image, and save it onto the computer. Save the image to the folder that we just created for our game. Any bitmap images used in a game should already be sized for how it should appear on the screen. Don't take a 5000x5000 pixel image from a high-resolution camera and then try to load it into a window only 800x600. Use a graphics program (even MS Paint will work) and resize/crop the image before using it in your Python program. Be careful about using copyrighted images. If you publish a game with images that you don't have the rights to, that's illegal. If you are creating your own work that you aren't sharing, then it is ok. If you are doing a class assignment, make sure that you check with the instructor for his or her rules around it. Finally, the image needs to be converted to a format Pygame can more easily work with. To do that, we append .convert() to the command to call the convert function. The function .convert() is a method in the Image class. We'll talk more about classes, objects, and methods in Chapter 12. All images should be loaded using code similar to the line below. Just change the variable name and file name as needed. Loading the image should be done before the main program loop. While it would be possible to load it in the main program loop, this would cause the program to fetch the image from the disk twenty or so times per second. This is completely unnecessary. It is only necessary to do it once at program start-up. To display the image use the blit command. This “blits” the image bits to the screen. We've already used this command once before when displaying text onto a game window back in Chapter 5. This code blit's the image held in background_image to the screen starting at (0, 0). Now we want to load an image and move it around the screen. 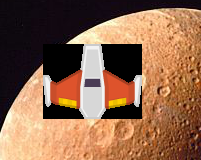 We will start off with a simple orange space ship. You can get this and many other great assets from http://kenney.nl/. See Figure 11.3. The image for the ship can be downloaded from the book's website, or you can find a .gif or .png that you like with a white or black background. Don't use a .jpg. To load the image we need the same type of command that we used with the background image. In this case, I'm assuming the file is saved as player.png. This demonstrates a problem. The image is a space ship with a solid black background. So when the image is drawn the program shows Figure 11.4. This will work for most files ending in .gif and .png. This does not work well for most .jpg files. The jpeg image format is great for holding photographs, but it does subtly change the image as part of the algorithm that makes the image smaller. Images in .gif and .png are also compressed, but the algorithms used in those formats do not change the image. The format .bmp isn't compressed at all, and results in huge files. Because the .jpg format changes the format, this means that not all of the background color will be the exactly the same. 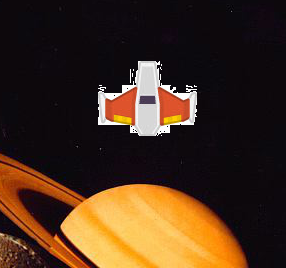 In Figure 11.5 the space ship has been saved as a jpeg with a white background. The white around the ship is not exactly (255, 255, 255), but just really close. If you are picking out an image that will be transparent, choose a .gif or .png. These are the best formats for graphic art type of images. Photos should be .jpg. Keep in mind it is not possible to change a .jpg to another format just by renaming the file extension to .png. It is still a .jpg even if you call it something different. It requires conversion in a graphics program to change it to a different format. But once in a .jpg format, it has been altered and converting it to a .png won't fix those alterations. Uncompressed sound files usually end in .wav. These files are larger than other formats because no algorithm has been run on them to make them smaller. There is also the ever popular .mp3 format, although that format has patents that can make it undesirable for certain applications. Another format that is free to use is the OGG Vorbis format that ends in .ogg. Pygame does not play all .wav files that can be found on the Internet. If you have a file that isn't working, you can try using the program Audacity to convert it to an ogg-vorbis type of sound file that ends in .ogg. This file format is small and reliable for use with pygame. Please note that you can't redistribute copyrighted music with your program. Even if you make a video of your program with copyrighted music in the background YouTube and similar video sights will flag you for copyright violation. # Load and set up graphics.